Super personalized gift for the Mom to be! 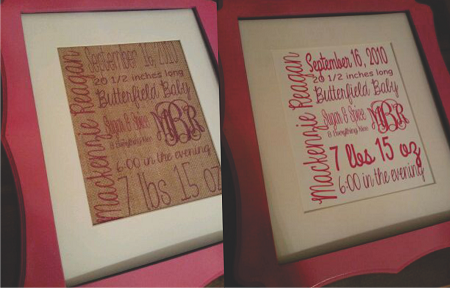 What a super cute and personalized gift! Your print will look exactly like this one, just with all of your little one's information. These prints are 8.5 x 11, perfect for your 11 x 14 frame matted to 8 x 10. Available printed on Burlap or a Canvas sheet. This listing is for the print only, no frame will be included. But shipping is!